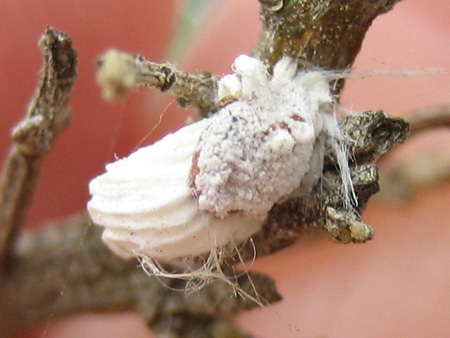 When fully grown, larvae burrow to the surface of the galls, where they develop their partially protruding white cocoons and pupate. 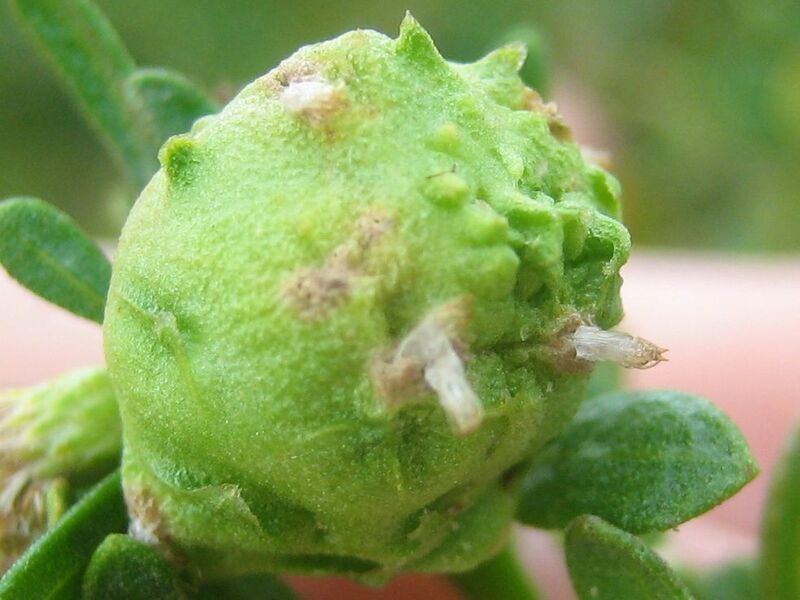 This species represents one of the rare situations among gall insects where fresh galls and emergence of adults occur throughout the year, depending on location and environmental circumstances, even though there is a pulse of growth and gall activity in spring. I don’t know how long pupation lasts, but I suspect it isn’t very long, or else I should have been able to find some galls with intact pupae protruding from their surfaces. 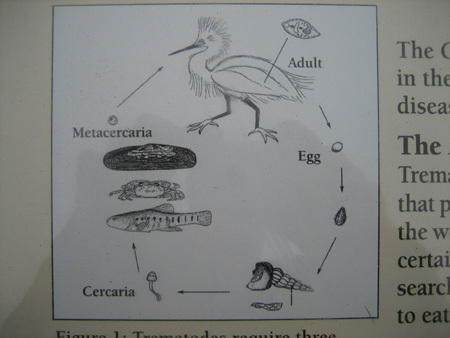 Or maybe I’m misinterpreting Russo’s description of what the pupation stage looks like. 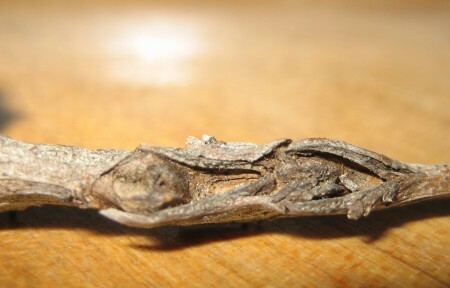 Maybe the pupae are near the surface, or barely protruding, and the exuviae end up protruding as much as they do only as a result of the emergence itself. 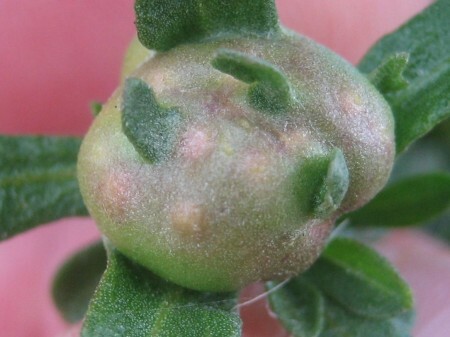 Here’s a gall with some interesting discolored bumps. I wonder: Could those be pupation sites? If I had cut that gall open, would I have found individual larval chambers under each of those bumps? Cell biologist Peter J. Bryant at UC Irvine has a neat page on Rhopalomyia californica on his Natural History of Orange County, California web site. Among the photos there are several showing newly emerged male and female midges, the females identifiable by their orange abdomens swollen with masses of eggs. 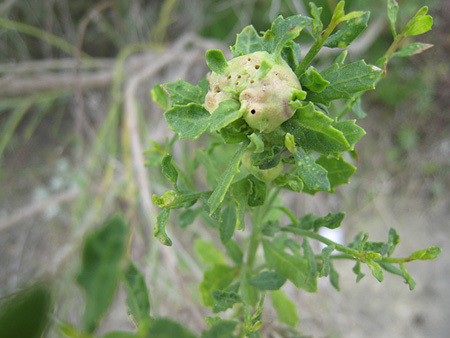 Although R. californica galls are found mostly in coyote brush, they also can occur in other plants. Dr. Bryant’s page shows a gall in a leaf of black sage and the midge that emerged from it; Bryant used DNA analysis to determine that it was R. californica. He also has photos of four different types of parasitoid wasp that emerged from R. californica galls. Dr. Bryant was kind enough to correspond with me once before (concerning the bolas spider). I think I might try pestering him again to see if he would be willing to give me any pointers on rearing R. californica galls to adulthood. I don’t necessarily want to harm the insects. Could I simply keep a removed stem in water? Or would it require a living, growing plant to avoid disrupting the lifecycle of the gall’s inhabitants? Even if I successfully raise gall midges to adulthood, it seems likely that I would be disrupting their chance to successfully breed. The adult midge only lives for a few hours; I would essentially be sacrificing its life merely to satisfy my curiosity. Am I okay with that? As a young boy I loved Hugh Lofting’s Dr. Doolittle stories. While writing this post I suddenly remembered a passage I hadn’t read in 40 years. It turns out to have been from Doctor Doolittle’s Garden. Doolittle, after long effort, has managed to decipher the language of insects, and has become fascinated by the Ephemera — insects with very short-lived adult stages, such as mayflies (Ephemeroptera) and gall midges (Cecidomyiidae). Doolittle and his young assistant Stubbins (of whom I was always deeply envious) bring a delicate fly into the lab. We worked on him for half an hour and our results were very meagre. He had things to say, we felt sure. But it was a language new to us. Clearly anyone who has to pack his whole life into one day must talk very fast. We soon got the impression that he was really pouring out hundreds of words a second. Only we weren’t catching them quick enough. The more I study R. californica the more questions I have. But in answering those questions, I don’t want to harm the object of my curiosity. I’ll have to think about this more. Yesterday Linda and I took a brief hike on the Jesusita Trail in Santa Barbara. The area we were walking through was burned in a 2009 wildfire, but it has mostly recovered now. Still, there are signs of the fire — blackened stumps and twigs — if you look for them. There is also a fair amount of coyote brush (Baccharis pilularis), so naturally that ended up being the focus of my attention. 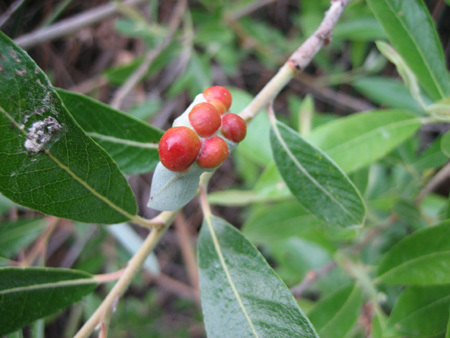 I was surprised to see that there were no Rhopalomyia californica bud galls on any of the plants. I’m not sure why that is. Maybe it’s a legacy of the fire, with the gall midges taking a while to reestablish themselves. Or maybe this is typical of coyote brush stands higher up in the foothills. 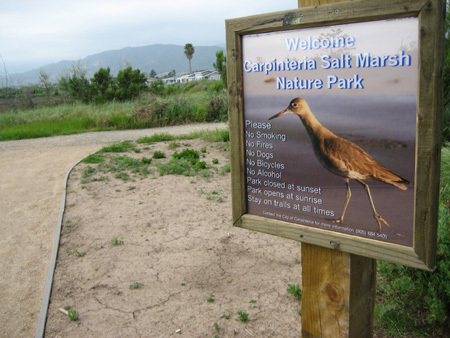 The Jesusita trailhead is more than three miles inland, while most of my experience with coyote brush has been at the salt marsh and the Carpinteria bluffs, right next to the ocean. Maybe R. californica is more of a coastal species? 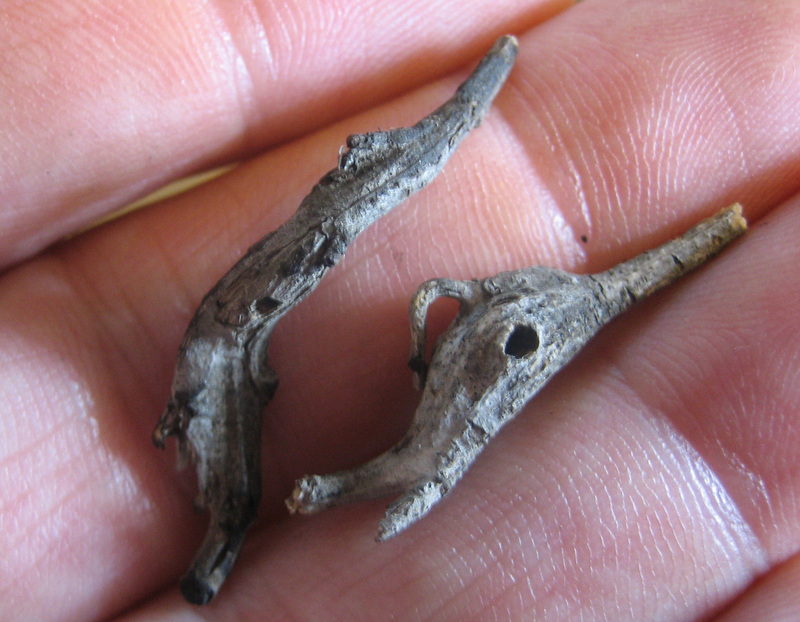 I think these twisted stem galls are fascinating, and I’m always looking for them, but whether it’s that they’re actually rarer, or just that they’re harder to spot in the foliage, I almost never find them. 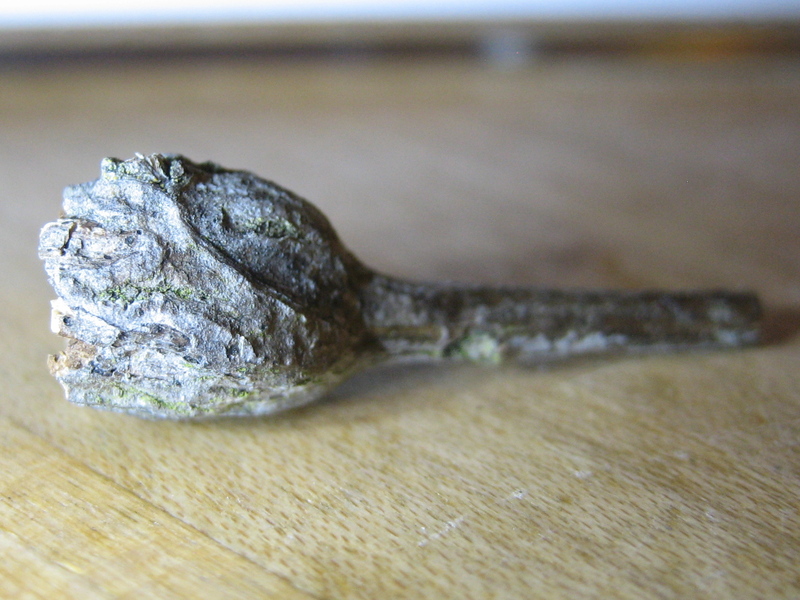 I come across dozens of terminal bud galls for every twisted stem gall I find. The next chance I had to visit the marsh was a few weeks later. I assumed I’d be able to find the plant quickly (the galls gave it a distinctive, gnarled appearance), but I ran out of time without finding it. By the time I could get back to the marsh for a more thorough search it was early April. Even looking more carefully, though, I couldn’t locate the plant. One was in the right spot, but it was much smaller than the plant I remembered, and had no visible galls, so I dismissed it quickly. Where were the stem galls? I really had seen them; I had photos to prove it. But now they just weren’t there. I wandered back to the center of my search pattern, next to the small coyote brush, and stood there scowling. I suddenly remembered a conversation I’d had recently with Andrea, the head of the docent program, about some new workers hired by the city, with whom she’d had words about their over-zealous pruning of the native plants. The workers had seen the coyote brush with its noticeably gnarled stems, and had done what any self-respecting gardener would do: They’d pruned away the damaged branches. Sigh. My quest for twisted stem galls continues. 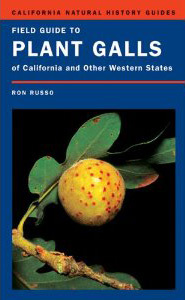 I’ve been reading Ron Russo’s Field Guide to Plant Galls of California and Other Western States. I first heard about the book several years ago from Andrea Adams-Morden, the head of the docent program at the Carpinteria Salt Marsh. It didn’t really excite my curiosity at first; I’d been drawn to the marsh by my interest in birds, and didn’t know much about plants and insects. Over time, though, as my appreciation of the marsh ecosystem grew, galls began to seem more interesting, and eventually I went ahead and bought Russo’s book. I’m glad I did. Field Guide to Plant Galls is a book that combines lots of detailed technical information with an infectious sense of wonder. And it turns out that galls really are quite interesting. 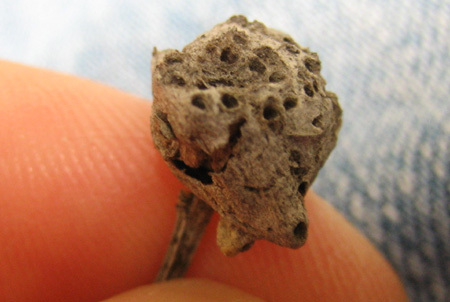 Since the galls of many insects (especially wasps and many flies) are specific to their species in size, shape, and color, there is most likely some genetic programming relationship between the compounds provided by the adults or larvae and the manifestations of plant cellular tissue as influenced by the host’s own hormones. 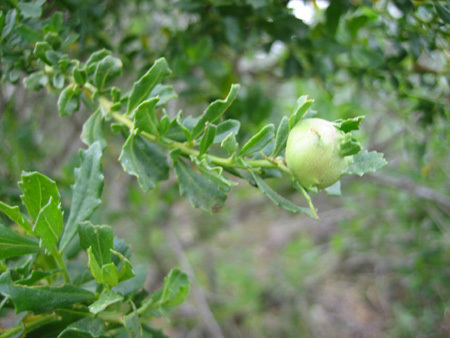 Something in the chemicals provided by gall organisms directs the expression of normal plant genes in the development and expansion of the host plant’s tissues. Scientists have been looking for a long time for this “blueprint” that seems to control gall characteristics. This has become the “Holy Grail” of gall research. 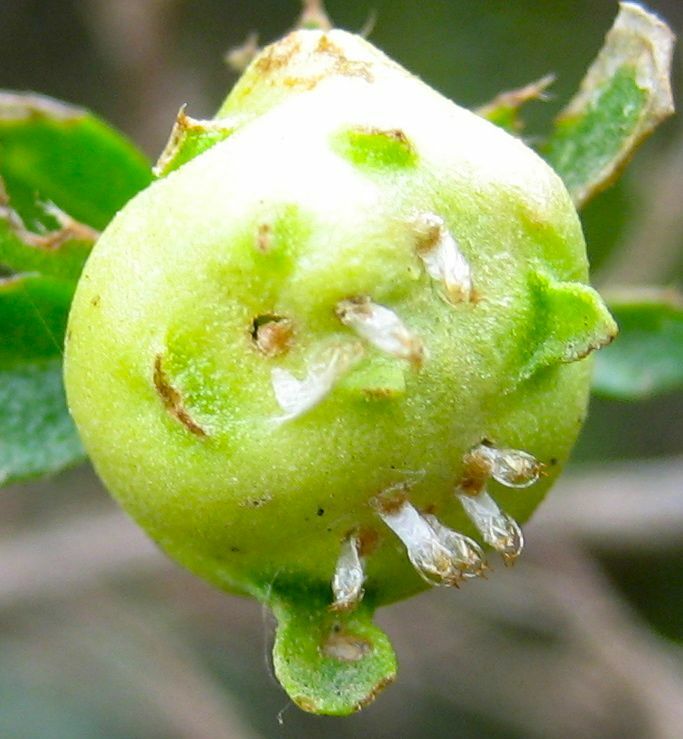 The complex relationships between gall inducers, host plants, and the communities of inquiline and parasitic species that associate with them are fascinating — and mysterious. Again and again in the book, Russo calls attention to the limits of current knowledge. Science increases the amount we know, but it also increases the amount we don’t know, in the sense that the larger an island becomes, the more extensive its shoreline. Russo’s enthusiasm for splashing around at the water’s edge is contagious. 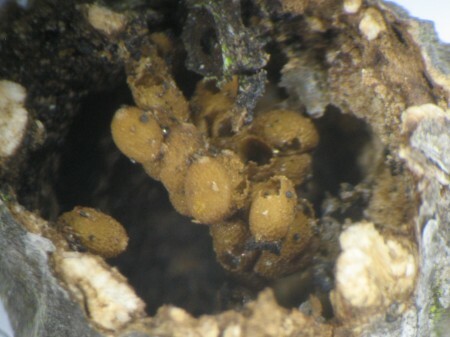 One interesting aspect of galls is that they can persist for a long time. 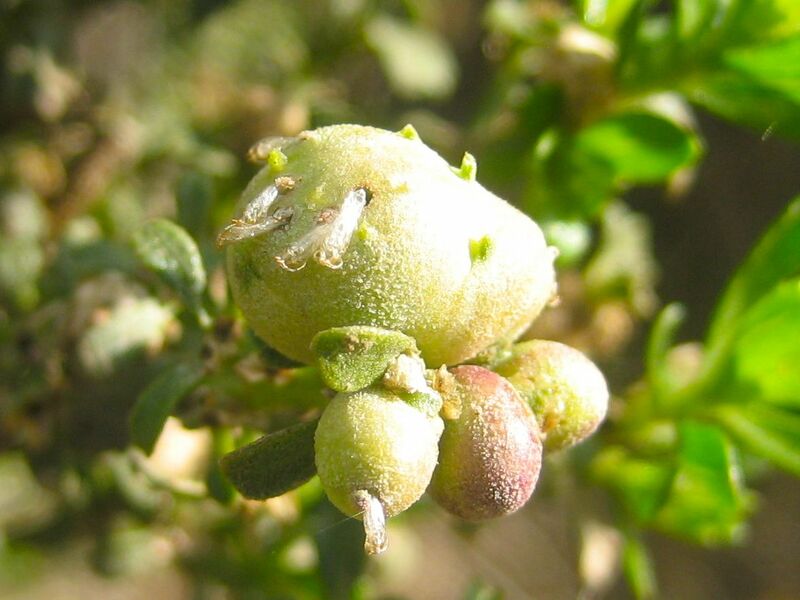 In this post I’m going to look at three old, dried galls that I discovered on my botanical crush, Baccharis pilularis, long after the original inhabitants were gone. I had read that R. californica was used successfully to curb an invasive weed in Australia (not coyote brush, but a related species, groundsel bush, Baccharis halimifolia). Recently I googled up some interesting material about that. Briefly, adults emerge from the gall in the first few hours after daybreak and mate soon after their emergence. Males are particularly short lived (2-4 hours) while females live 12-14 hours and occasionally longer. Females can be recognized by their orange abdomen, the coloration of which is caused by the mass of vermillion colored eggs. 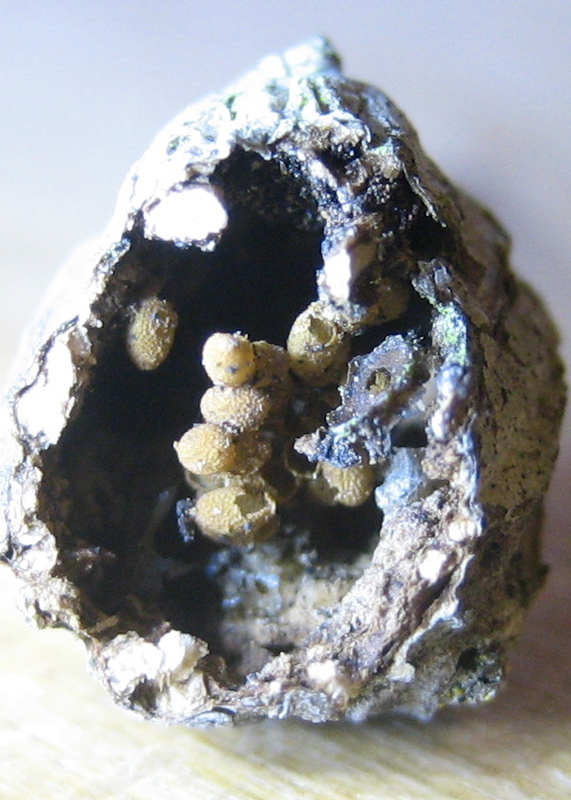 They oviposit approximately 100-150 eggs on the surface of meristematic tissue at stem terminals and occasionally in leaf axils. Neonate larvae enter the stem between bud scales and produce a gall on the stem. A number of larvae form a community gall and these galls can contain more than 50 chambers each housing one larva. 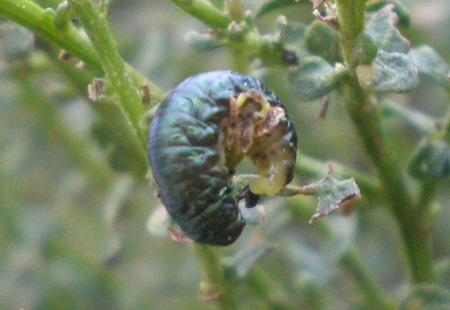 The larvae complete their development and pupate within the gall. Flies emerge within two months after oviposition. I still haven’t seen an adult midge on coyote brush, but I’ll have a better idea what to look for now. 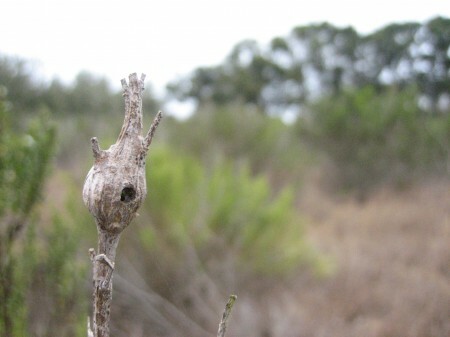 I also really want to see a gall with the insects’ pupae protruding from its surface, or with the spent exuviae left behind after the adults emerge. Chuck Baughman has some beautiful pictures of what I think are exuviae (though he commented previously that he thought they might be the bodies of emerging adults killed in a cold snap); they’re definitely worth checking out at BugGuide: Coyote Brush Bud Gall Midge – Rhopalomyia californica. In many cases it is easier to identify gall-inducing insects by their galls, rather than by the insects themselves. 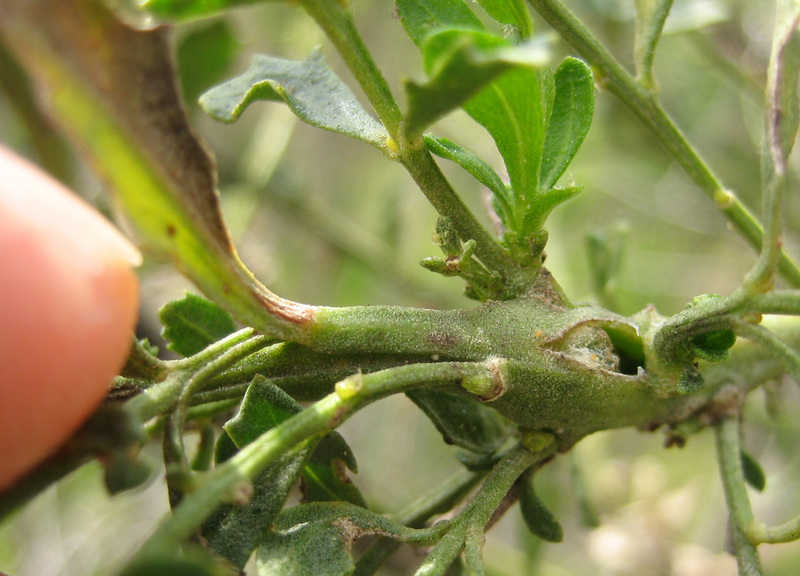 That’s the case with another Rhopalomyia midge that forms galls on coyote brush, Rhopalomyia baccharis, the coyote brush stem gall midge. 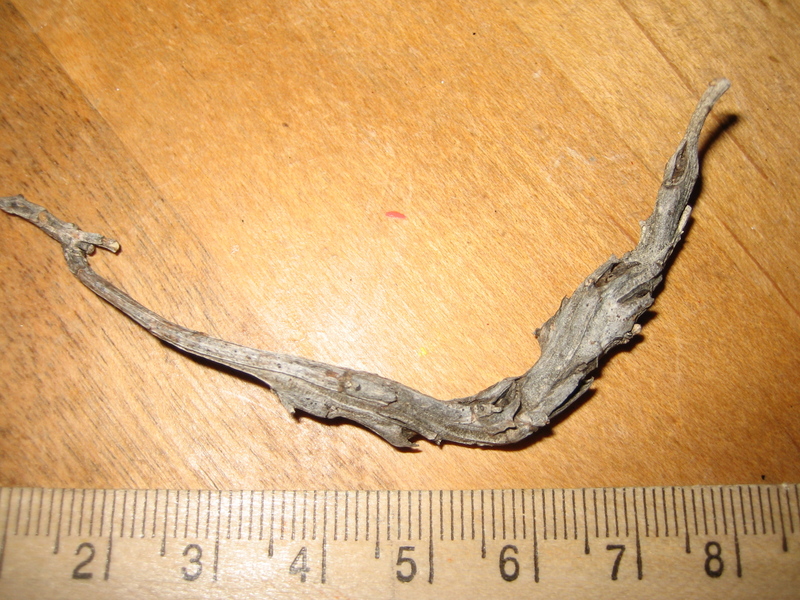 The insect itself is more or less indistinguishable from R. californica. But the gall it produces is very different. The rounded-edged, elliptical holes are not typical of the normal sharp-edged, round exit holes created by insects, and they do not appear to have been chewed open. 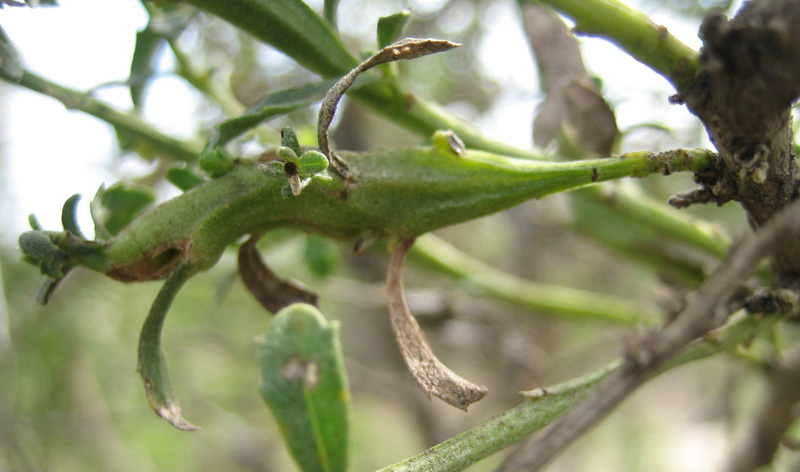 While we have no clear answer at this point, the convenient exit holes appear to be created by the plant after larvae have stopped feeding and stimulation from the larvae has ceased. 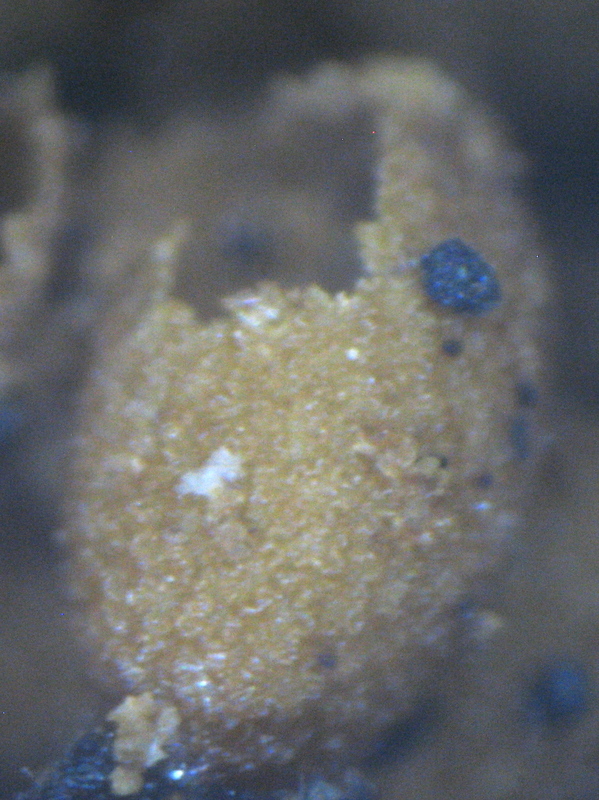 These holes develop before the larvae (at the bottom of the chambers) change into pupae. Shortly after the holes are created, pupae develop and remain at the bottom of the chambers. 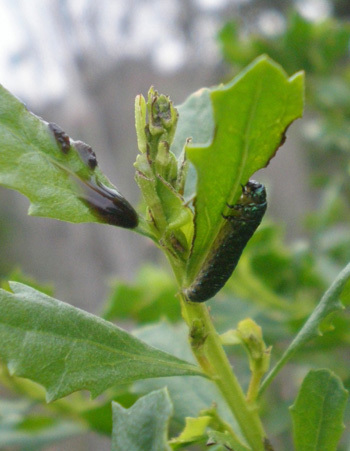 Pupation occurs inside the galls, and the adults emerge through the openings in November and December. These unique circumstances make this species stand out from all of its relatives in which the pupae partially push their way out of the gall before the adult emerges. 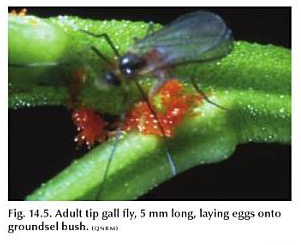 Much more needs to be learned about the habits of this mysterious and interesting gall midge. You humans. When’re you gonna learn that size doesn’t matter? Just ’cause something’s important, doesn’t mean it’s not very, very small. My final gall illustrates this point nicely. 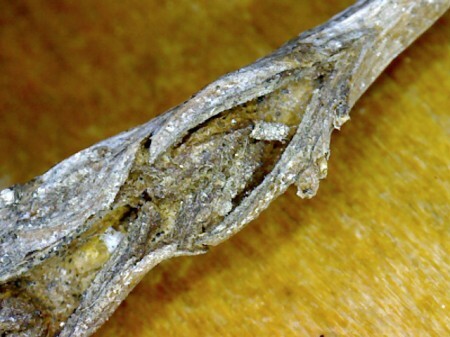 The frass that accumulates inside the gall serves as a culture medium for various fungi, which are eaten by several fungus insects after departure of the moth. 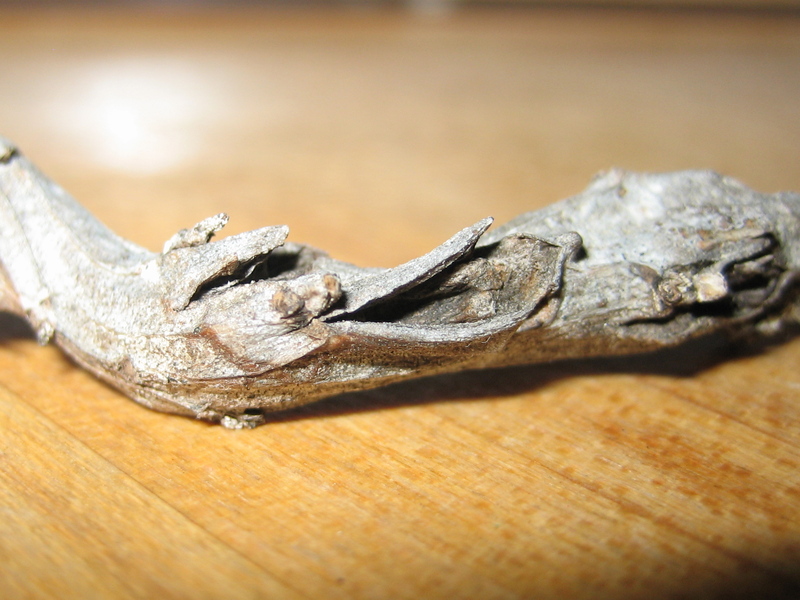 Tilden (1951) found at least 10 parasites associated with this moth in addition to 17 other insects that were connected to the gall or the moth in some manner. The intricacies of these complex relationships stagger the mind for such a common, yet so disregarded, shrub. The other day at the bluffs William and I came across an old G. baccharisella gall. I removed it and handed it to him, pointing out the emergence hole. He took his scientific curiosity a step farther than I had: He broke it in half. 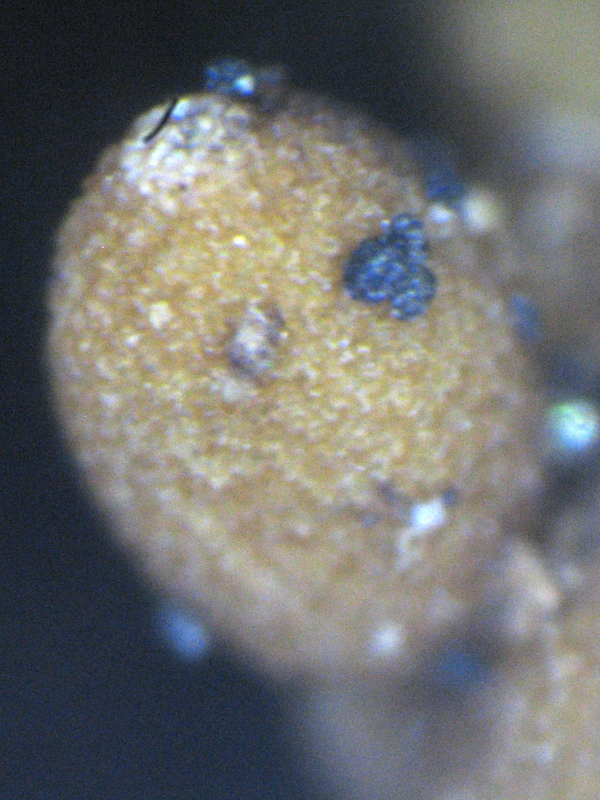 I’m not sure, but I think that’s a fungus mite of the order Mesostigmata (see, for example, this similar-looking mite at BugGuide). I few years ago I would have overlooked all three of these galls. But with helpful people like Ron Russo showing me the way, I’m learning to look closer. I think it’s an old, dried-out bud gall from the same midge I mentioned previously, Rhopalomyia californica. I like that you can see what I assume are the holes made by the adult midges when they emerged from the gall. I’m curious what the adult insect looks like. I’ve tried googling for images of it, but so far I haven’t found any. At least I have an idea of how big they are: just big enough to squeeze out of those holes. 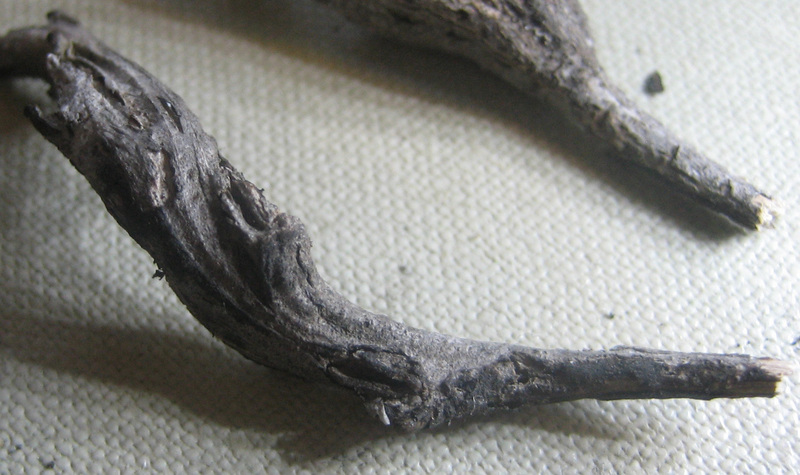 This gall, which is still on a living plant, shows the same emergence holes as my dried version. I wonder what it looks like when the midges emerge. Do they all come out at the same time? I’d really like to see that some day. Update: They do emerge together. 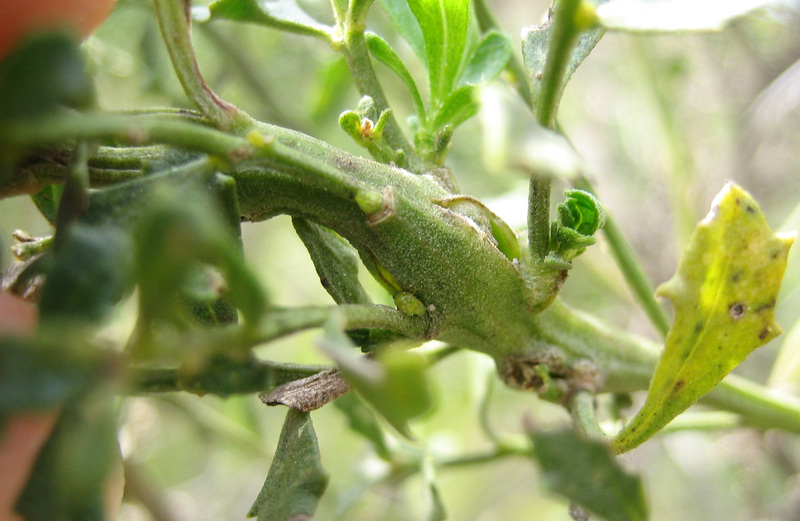 Check out this amazing series of photos taken by Charles Baughman on March 28, 2010, of a bunch of adult Rhopalomyia californica emerging in Boulder Creek in Santa Cruz County: Coyote Brush Bud Gall Midge – Rhopalomyia californica. Later update: I take back part of what I wrote above: I don’t think those photos by Charles Baughman show adult midges emerging. I think they show the spent exuviae left behind after the emergence. Still beautiful and amazing images, of a phenomenon I’d still love to see firsthand. As I write this, at the tail end of 2010, we’re coming up on R. californica emergence season. I’ll make a point of checking those galls over the next several months, and see what I can find. I really enjoy GrrlScientist’s Living the Scientific Life (Scientist, Interrupted) blog (especially the “Mystery Bird of the Day” feature), so when she mentioned recently that she was looking for submissions for the Circus of the Spineless blog carnival, I decided to take a walk at the salt marsh to look for invertebrates, and write about what I found. There’s a new sign at the north entrance to the marsh, by the way. Wouldn’t this make a cool photo for Mystery Bird of the Day? Can you recognize the bird? It’s a common species in the marsh and on nearby beaches. 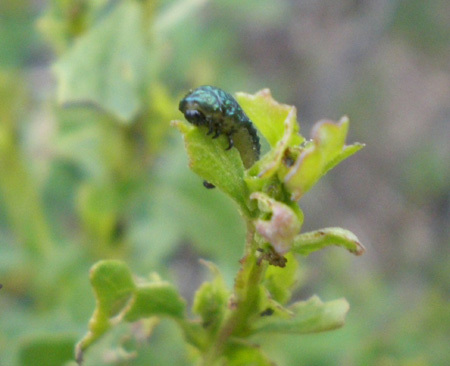 One of the first invertebrates I noticed at the marsh during my walk were these shiny green insect larvae, happily munching away on the leaves of coyote brush (Baccharis pilularis). 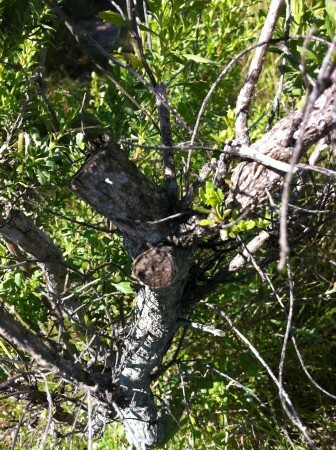 These guys were on every coyote brush I looked at; I count six of them in this picture alone. I did a quick estimate, and decided that there were about 500 of them on a single large plant. 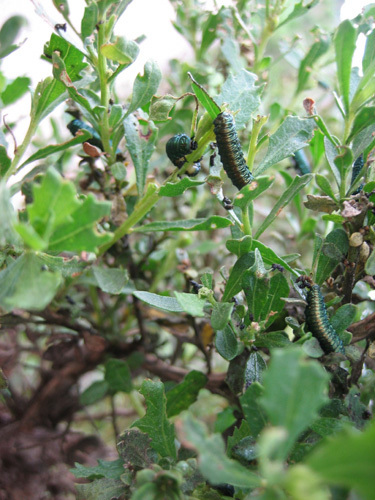 Multiply that by the amount of coyote brush at the marsh, and that’s a lot of larvae. At first I thought they were some kind of caterpillar, but after posting my photo at bugguide.net, early speculation has centered on the genus Trirhabda, a kind of leaf beetle. Looking at this image of Trirhabda flavolimbata made me remember that several months ago I’d seen a beetle that looked a lot like that all over the coyote brush. According to this entry at bugguide.net, there are at least three species of Trirhabda in coastal California, with T. flavolimbata being the one that specializes in coyote brush. Update: I took most of the photos in this blog entry during a walk with William on Sunday, March 29. Based on the discussion at bugguide.net, I went back this morning — Thursday, April 2 — with Julia to get some better photos. Here are three that she took (posted at bugguide.net here, here, and here). This shows the larva’s body, as well as a dark fluid on the plant that I’m assuming is related to the larva in some way, though I’m not sure how. Maybe it’s fluid that is draining from the fresh “frass” (insect poop) on the leaf above it? If these were caterpillars or sawfly larvae, I might be a little worried about their health, but more “soupy” excrement isn’t too unusual for leaf beetle larvae. You know, I never expected when I got out of bed this morning that I’d be learning about the consistency of leaf beetle excrement. But I think it’s cool that the larva’s soupy poop actually helps confirm the ID. Finally, here’s a shot that shows the larva’s prolegs. Some of the commenters at bugguide.net were especially interested in seeing those. 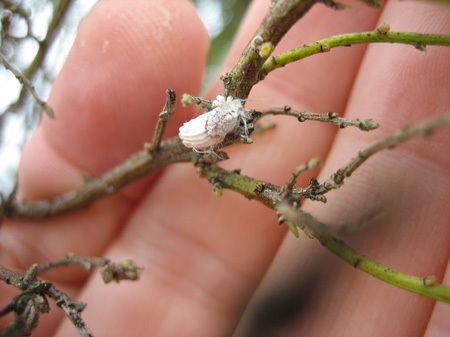 This is a female scale insect. The actual insect is the brownish thing at the upper right, covered by white waxy fibers. She’s attached herself to the plant, and is more or less immobile. The large, white, grooved part extending to the left is not her abdomen, as I originally thought. It’s an external egg case. The cottony cushion scale is not native to North America. It hitchhiked here from Australia in 1868, arriving on a shipment of plants and soon becoming a serious pest in the California orange groves. The scale was eventually controlled by introducing one of its natural predators, an Australian lady bug. When I read that, it reminded me that I’d already read another account of that same event, in Sue Hubbell’s excellent book, Broadsides from Other Orders. I had no idea what insect might have done this, though Charley Eiseman responded at bugguide.net that he thinks it was made by a species of midge, Rhopalomyia californica. Looking at some of the other photos at bugguide.net, I think he’s probably right. I’ve been unable to find an image of the adult midge, but Flickr user “Eric in SF” opened up one of the galls and took a photo of the larva. Again, I had no idea as to the species of insect involved, but Charley Eiseman wrote at bugguide.net that he thinks it is a sawfly of the genus Pontania. As I mentioned, the marsh’s patch of coastal dune habitat is small, but it’s very important to at least one species: the globose dune beetle (Coelus globosus), a coastal specialist that has become rare as coastal dunes give way to houses and condos. Andrea Adams-Morden has pointed out the trails in the dunes to me and told me they were produced by globose dune beetles, and I’ve seen a few dead beetles, but so far I’ve never found a live one. 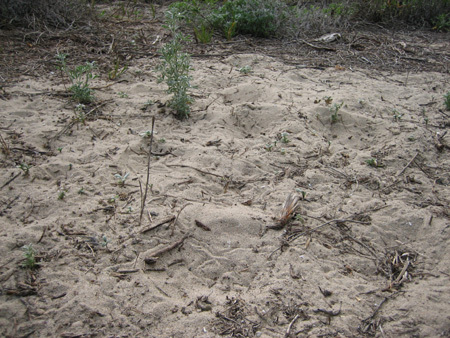 In the meantime, I like checking out their trails, which the beetles leave as they burrow just under the surface of the sand. Can you see the beetle trails in this photo? There’s a neat series of photos of a related species, Eusattus dilatatus, at the myrmecos blog: Friday Beetle Blogging: Eusattus Dune Beetle. 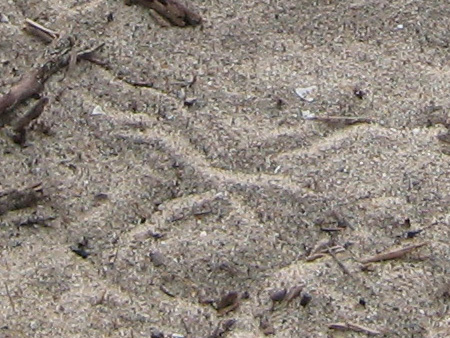 You can see the beetle burrowing into the sand, a process that takes about 30 seconds. 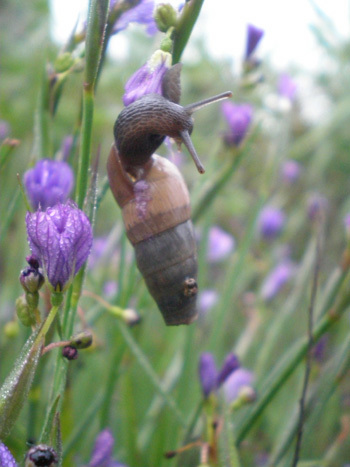 One of the best-known invertebrates in the Carpinteria salt marsh is the California horn snail (Cerithidea californica). Millions of these marine snails live in the marsh; you can see them crawling over the mudflats at low tide, and after they die their shells get washed out of the marsh entrance and turn up along the beach at Carpinteria, where I’ve picked up dozens of them during a single walk. If you want to learn more, you can see the image of the whole sign that I posted on Flickr, and click through to the largest size, which should be fairly readable. 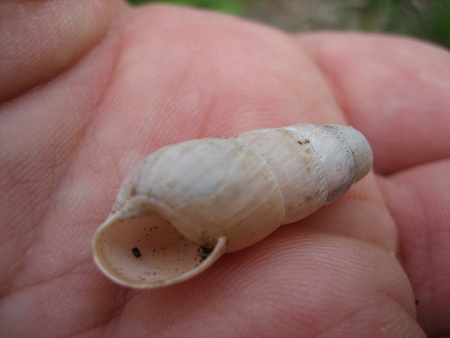 One other invertebrate at the marsh, one that’s actually kind of similar to the California horn snail in size and shape, is the decollate snail (Rumina decollata). It’s a terrestrial snail, not an aquatic one. I noticed them crawling across the trail near Ash Avenue one morning when I was walking the marsh with William, and I was surprised, because I’d never seen an elongated snail like that on land before. An email to the carpmarshfriends Yahoo group got me some help with the ID, after which I learned more about the snail at the nice Wikipedia article on it. Decollate snails are non-native; they originate near the Mediterranean, and are predators who feed on the eggs and young of other snails. They’re used by gardeners as a means of controlling another non-native, the invasive brown garden snail, and presumably that’s how these guys got into the marsh: crawling in from someone’s garden along Ash Avenue. She also got this shot from the other side, showing what looks to me like a thread of some sort emerging from the area of the snail’s mouth. I didn’t notice it at the time, so I can’t tell you anything else about it, but it’s certainly interesting. What’s going on with that? Thinking about it some more, and staring at the largest version of the image, I find myself thinking a wacky thought: What if the snail actually ate a spider? Could that happen? 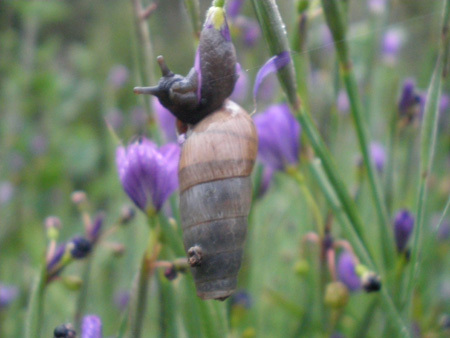 If it did, could it have left the spider’s dragline extending away from the snail’s mouth? I guess it’s a lot more likely that the snail decided to snack on a stray piece of silk, or just ran into it and got tangled up. Overall, I had a really fun time rummaging for invertebrates at the marsh. I hope you enjoyed reading about them. You are currently browsing the archives for the Galls category.